Are you creating partnerships with your donors? A sense of loyalty and commitment? Your organization’s thank you letter is the important first step in creating loyal, lifetime donors. Does yours have all 10 essentials? 1. Joy. You want, first and foremost, to make the reader – the donor, your friend, your supporter – experience a genuine sense of joy when they open your letter. Suddenly your donor is a hero. She’s making your work possible and you’ve let her know — in no uncertain terms. Somehow her life seems a little less exhausting than it did 15 minutes ago. 2. Speed is of the essence. You must get your thank you letters out within the first 48 hours. When your dog has an accident on your living room rug, rubbing his nose in it two hours later isn’t terribly effective, is it? What system can you put into place to ensure promptness? 30 minutes a day every day first thing in the morning thanking donors? What will work for your organization? 3. Personalize. 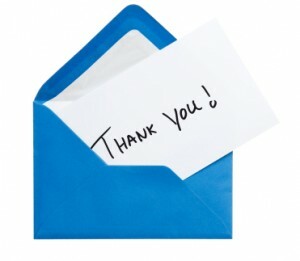 Your thank you letter (or any letter coming from your organization for that matter and that includes emails) should be personalized. These days there is absolutely no excuse for the “Dear Friend” letter. No excuse. 4. Reference the amount in the body of the letter. It’s nice to include the date of the gift as well for tax receipt purposes. 5. Reference what the gift was towards. Was it an in memoriam gift? An annual appeal gift? A matching gift appeal? 6. Is the donor’s past giving acknowledged? If a donor has given every year for the past seven years you’ll want to be sure to let them know how much their continued support means to you. 7. Tax deductible language can be printed in an italic, 8 to 10 point font, centered, below the signature and PS. 8. Don’t forget your PS. The PS can be used to drive donors to something new – a Facebook page or a new Twitter account. Perhaps a new blog on your site or your new enews. 10. Never, ever, ever ask for a second gift. Now I may change my mind on this one someday. But I highly doubt it. There are two schools of thought on whether an organization should have what’s known as a “soft ask” in a donor thank you letter. You can read the debate, between two well respected fundraisers, here. According to nearly every recent poll, women are increasingly taking the lead in philanthropic decisions. Put simply, women write the checks and are more finely attuned to good etiquette. It simply isn’t good manners to include any ask within a thank you letter – and that includes including a business reply envelope. Your thank you letter’s sole purpose should be to thank your donor. Period. Want more? Download the Donor Love Toolkit, your free guide to loving your donors throughout the year. Thanks again for your useful writing & resources. Thanks, Pamela! I am presenting an academic course this term at my university on fundraising for nonprofits. May I share this blog post with my students? Thanks!